We used to live five hours away from the city of Toronto. This was fun for many reasons, not least of which being we could wow ourselves with international travel and still not be trying very hard. A few summers ago, we took the whole family to see a Toronto Blue Jay’s baseball game. This trip was my husband and I toting all four of our children, most of who are able to keep their hands and feet to themselves in their current life stage, a couple who were still Touchy McTouchersons in any social setting. We climbed to our nose bleed seats for $8 a piece, decked out in our Detroit Tigers gear, dropping raisins and popcorn like squirrels in the forest as we went. Once settled in they opened the dome to the bright July sunshine and we all sang the Canadian National Anthem together, followed by the Stars and Stripes Forever. The game was fun and interesting with run scoring trading off between teams and innings. The seventh inning stretch came and very enthusiastic Blue Jay fans all around sang a roaring rendition of a cheesy fan song we had never heard before, which left us all in the kind of stitches that goofy cultural experiences will. I know my eyes went wide, heat flushed up my neck. I mean, what’s an international family experience without some custom international embarrassment? I have been to my share of sporting events. I have cheered the Cubs on in the drunk section of the bleachers at Wrigley Field. I have listened to Penguins fans boo their own team in a playoff game. I have stood in standing-room-only seats surrounded by Yankees fans with a giant Tiger on the front of my t-shirt. Sports can bring out the rude in people. This guy, at the Toronto Blue Jay’s game, however, was far from rude. He was polite and on that day in Toronto I learned the heart of rudeness: inattention, thoughtlessness, the absence of concern. Love is not rude because it takes time to think outside of itself. How many people can you notice today? What might even five of those people need? Grab a notebook, a sticky pad, or a piece of scrap paper and jot down the places you go in one day as you visit them. Then go back and consider, “Who else was there besides me?” Maybe you didn’t know them, maybe they are faceless beyond, “Guy in a green shirt.” Just notice. Love is not rude is concerned with the art of noticing. God notices us. He sees our pain. He hears our laughter. He sent Jesus into darkness and He sent His Spirit to simply be near us. Whether in stadiums full of people cheering, or quiet moments between two friends, we can love brave by looking around and checking in with all the other people wandering this planet. 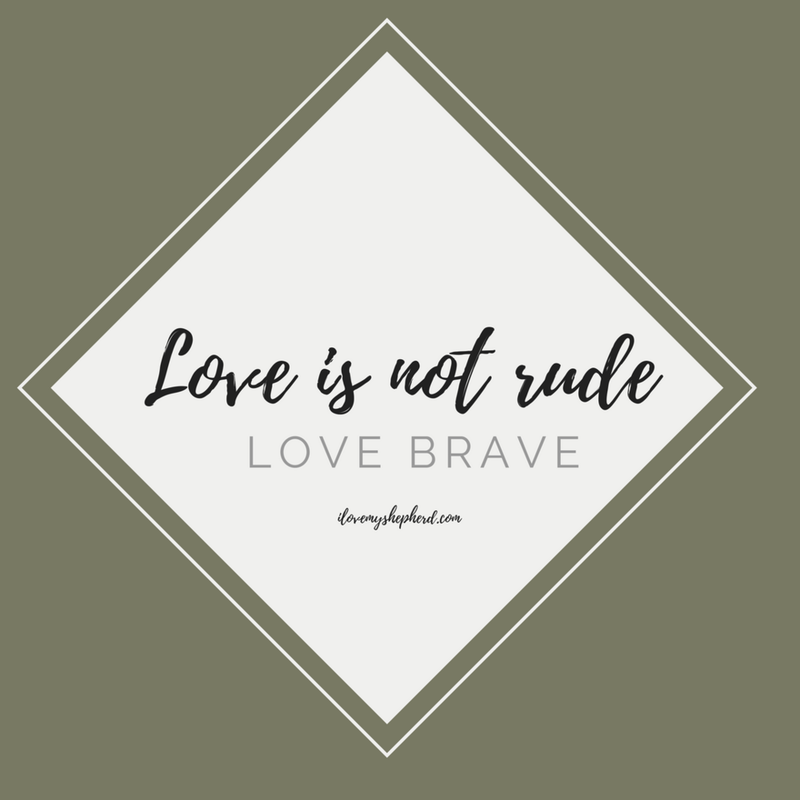 Love brave, and a little less rude, by noticing someone today. Heidi’s blog reminds me of something that happened in my life just a few months ago. I had the phenomenal opportunity to attend Avengers: Infinity War with my 3 kids. This was an event we’ve been building toward for years, watching every movie in the Marvel Cinematic Universe to prepare. As we were basking in the glory of this initial viewing, I began to hear the faintest sound of music. It was like someone’s cell phone ringer was going off, but it was muffled. I looked around in complete disgust. They told you before the movie began to silence your cell phone. The sound went away for a while, but came back! ARE YOU KIDDING ME?! TURN OFF YOUR PHONE! YOU ARE RUINING THIS FOR ME! I looked around again, shifting uncomfortably in my seat, and the music got louder. OH NO. I looked at my watch, and I had music playing on my phone. Earlier in the movie, in a scene of relative scariness, my youngest had grabbed my arm, and touched my watch to check the time. Because it’s an Apple Watch, she had inadvertently started the music playing on my phone. YOU ARE THAT MAN! I imagined the Prophet Nathan telling me. (Reference link to the Bible passage.) I was so quick to cast judgment on that other person who was being rude, but it was me. I was rude. I was broken. I needed to ask for forgiveness. Love is not rude. I’m convicted by Heidi’s words, as I am by God’s own words, because there are times where I’m the guilty party. By noticing my own capacity for rudeness, it helps me to not hold others to some impossible standard which I can’t meet myself. It helps me to see them, the way God sees them.